I love the Christmas story. I love it so much that I keep a tiny nativity scene on my desk all year long. It is a constant reminder to me that God loved His creation so much that He was willing to become flesh so that He could die for our sins to make it possible for us to be reconciled to Him. In telling the story year after year, we focus, as we should, on the precious baby laying in the feeding trough — the baby who is Emmanuel, "God with us." Almost equal attention is often given to the baby's virgin mother, Mary. We also hear about the chorus of angels who appeared to the shepherds, and we hear songs sung about the Wise Men who came from afar, seeking the king whose sign they had seen in the heavens. All of that is fine and proper. But in the midst of all the remembrance and celebration, one key character is usually forgotten and that, of course, is Joseph, the stepfather of Jesus. Perhaps Joseph remains in the shadows because we know so little about him. We can rightfully agree that Mary was probably around the age of 14, since that was the age of marriage in those days. But there are no clues as to Joseph's age. There are church traditions that say he was an older man and may have been a widower with an existing family, but no one knows for sure. He was of the tribe of Judah, descended from David through Solomon (Matthew 1:1-16). He was a craftsman, most likely a carpenter (Matthew 13:55). He was a righteous man before God (Matthew 1:19). He must have also been a man of compassion and forgiveness because when he discovered that Mary, his betrothed, was pregnant, he could have had her publicly humiliated and stoned to death. Instead, we are told that he decided "to put her away secretly" (Matthew 1:19). It was at this point that God intervened and spoke to him in the first of four supernatural dreams. In the dream, the Lord assured him that he should not be afraid to take Mary as his wife "for that which has been conceived in her is of the Holy Spirit" (Matthew 1:20). About two years later, Joseph had a second dream in which the Lord warned him that Herod was going to search for the Christ Child and destroy Him. He was told to take his family and flee to Egypt. He obeyed this command immediately, and Jesus was delivered from the horrible massacre of children that occurred in Bethlehem (Matthew 2:16). After the death of Herod, while the family was still in Egypt, God spoke to Joseph in a third dream, telling him to "return to the land of Israel" (Matthew 2:19-20). He evidently intended to settle somewhere in Judea, but en route he experienced a fourth dream in which he was warned that Judea was not safe. In response to this dream, he headed back to the Galilee to his home town of Nazareth from which he and Mary had begun their perilous journey several years before (Matthew 2:22-23). The last we hear of Joseph is in Luke 2:41-51 where we are told that during one of the family's annual pilgrimages to Jerusalem to celebrate the Feast of Passover, Jesus was accidently left behind when the family's caravan departed to return home. Jesus was 12 years old when this happened. This story reveals what a pious man Joseph was, for it was a long, arduous, dangerous, and expensive journey from Nazareth to Jerusalem. Yet Joseph took his family every year. 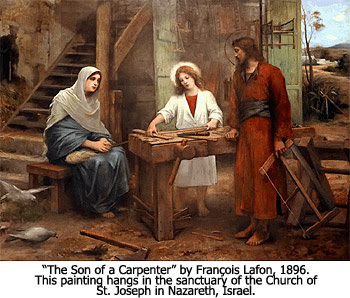 Joseph evidently died before Jesus began His public ministry at the age of 30, because no mention is made of him thereafter, except for the fact that when Jesus began teaching in Nazareth the first time, the people proclaimed in amazement, "Is not this the carpenter's son? Is not His mother called Mary, and His brothers, James and Joseph and Simon and Judas? And His sisters, are they not all with us?" (Matthew 13:55-56). The very wording of this statement indicates that Joseph was dead by this time since he was not mentioned by name among the living relatives. From the little we know about him, I think we can conclude that Joseph was a godly man who communed with the Lord, observed the Law of Moses, and who undoubtedly raised his stepson to honor God and His Word. We desperately need more fathers like Joseph today. And God look inside and saw real gold. Then gently guided you with His commands. Except you took Mary to be your wife. And in laughter and silence you both did share. In giving your life to Jesus too. Great poem, C~inSalem! She captured the importance of Joseph's quality so well. Thank you for the poem; it is so precious. Joseph was truly a very special man.